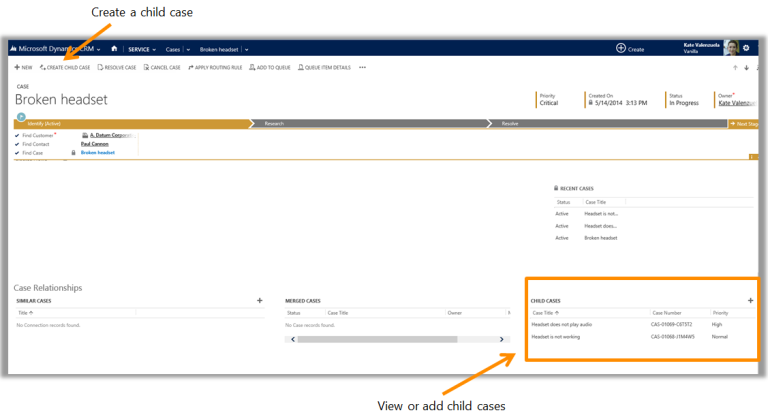 You can manage multiple cases more efficiently if you use parent and child cases in Microsoft Dynamics CRM. When you need to track a case where work needs to be done by other departments or when you need to track the same issue for multiple customers, you can open a primary case called the parent case, and then create secondary cases called child cases. For example, if you get a service request to install new electrical and gas connections, this requires work to be done separately by the gas and electric department. In this situation, you can open two child cases, one for the gas and the other for the electric department. The original case is marked as the parent case. Once the child cases are resolved, you can then close the parent case. Similarly, you can create parent and child cases when multiple customers call in about the same issue, for example, a network outage. Instead of creating a new case for each customer, you can create a parent case to track the main network outage with the Network Operations team, and then create child cases when customers call in about the issue. Note, a child case can’t have a child case. For Microsoft Dynamics CRM Online organisations, this feature is available if you’ve applied product updates for CRM Online Spring ’14, or if you’ve installed the CRM Online 2015 Update. For on-premises CRM organisations, this feature is available if you’ve installed CRM 2013 Service Pack 1, or if you’ve updated to CRM 2015. When you need to create a child case for the case you’re working on, you can quickly do this from the case form. A case can only have up to 100 child cases. On the command bar at the top, choose Create Child Case. Or, choose to expand Case Relationships, and next to Child Case, choose (+) Add Case record. Next, fill in the necessary case information for the child case, and then choose Save. To see the child case that was just created, from the parent case, choose Case Relationships, and you’ll see the child case listed under Child Cases. You can create a case and then associate it as child case. A child case can’t have a child case. a. Select the cases that you want to associate as parent and child case(s). You must select at least two cases. b. On the command bar at the top, choose Associate Child Cases. c. In the Set Parent Child Relationship dialog box, from the list of cases, select the case that you want to make the parent case, and then choose Set. a. From the open case form, choose to expand Case Relationships, and next to Child Case, choose (+) Add Case record. b. Choose the Lookup button, and then find the case you want associate as the child case. You can associate a parent case to a case from the case form. Open the case that you want to link a parent case to. From the case form, choose the Parent Case and use the search to find a case that you want to associate as the parent case for this case. Sometimes, resolving a case action might be blocked based on your current case status. This is because your admin may have set things up so that you only see a limited set of statuses to choose from based on the current status of a case. For more information about the available list of case statuses, contact your administrator. When all the child cases are resolved, you can then close the parent case. When you resolve the parent case, it will then resolve all the active associated child cases. A parent and child case can be closed independently of each other. This is the default setting. Before you resolve a parent case with active child cases, make sure that all the case activities are closed. Otherwise, you’ll get a warning stating that you need to manually close the open activities or the system will automatically cancel the open activities when the case is resolved. Also, performance may be slow when you close a parent case with lots of active child case associated with it. A case resolution activity is created and shown in the Activities area. A case resolution activity contains information about a resolved case, including the resolution and total time spent on the case. You can reactivate a resolved case at any time.